Another Tattoo spotted! 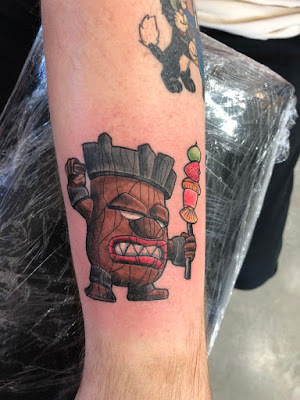 @SoulessShinobi just tweeted this picture of his new awesome tattoo, of one of the tiki idols that I worked on in the Spyro Reignited Trilogy. It turned out great! This marks the third person with tattoos of one of my game characters.... that's just nuts! I made this video to show how you can use a Vox Amplug AC30 and a Xvibe Vibration Speaker, to make a poor man's ToneWoodAmp. And also realized that this can be used for electric guitars as a practice amp, without having to be right next to a traditional amp. This is great for just kicking back on the couch, or make a great traveling amp. Yamaha GL-1 Guitalele is a $100, 6 string guitar-ukelele hybrid, tuned A-A. With a lot of experimentation, and searching guitar/ukulele forums, I was able to get it to tune E-E, standard guitar tuning. I did this by using standard tension nylon strings, removing the highest string, and shifting the remaining strings down, and adding the lowest string with an extra high tension low E string. It stays in tune well, after a couple weeks of letting the strings settle in. Obviously this isn't what the Guitalele is made for, so do at at your own risk. The low E string is slack, and the rest of the strings aren't tuned up much higher than before, so overall pull on the neck isn't very different, I think. Mine's been working out great for a few months now, but again.... your milage my vary, and do it at your own risk. A-A tuning on the Guitalele actually sounded great, very sweet and ukulele sounding, and you can play and practice like a guitar... But I wanted to learn to sing with it, and my unfortunate limited vocal range just can't go that many steps up, otherwise I'd just stayed with the A-A. I've also replaced the saddle with a tusk saddle, but I don't hear an improvement there, so I wouldn't recommend going through the trouble. Overall it's a great travel guitar, couch guitar, and just something fun to play with, it's so cute! It is very small, and feels very cramped because of the super short neck scale, but it has very good nut width. The string spacing at the saddle is where it feels very tight for finger style, and I wished that it was spaced out more there. Still, it is pretty fun to mess around and practice with. This video was recorded on the iphone, using Movie Pro app, with the remote app. I also used a usb mic, the Samson CO1U Pro, and USB to Lightning connector. Here is a video comparison between the new iPad Pro 10.5, and the original 12.9. See the original full iPad Pro artist review, for the full rundown. So far, I'm loving it! And Kotaku's Review, And Forbes article, covering the free Skylanders Creator App, for iOS and Android, and info about custom t-shirts, playable cards, and 3d prints! My family's been having a blast making their own characters, too. After they've made theirs, I started to make my own Imaginator. My wife and my oldest son were being backseat drivers, telling me what to pick, what looked best, and I said "hey who's the Skylander designer here? ", to that they both said "we are". Yup, YOU all are! My wife's character, very cool looking and gears are largely chosen by stats. My son's character, is a pumpkin and snake themed dude, his name is... wait for it... Pumpkin Snake. Our little guy's creation is a baby, with construction robot body, plunger ears, cupcake hat, fish weapon, eagle armor, with stinky green cloud.